Nanshy is proud to introduce Vegan Makeup Brushes – synthetic nylon brushes specially designed to be safe to use. Just like all of our first-rate makeup accessories, we provide 100% professional-grade quality Vegan items. We remain eco-friendly and in making our products, we refuse to harm any animal. PETA (People for the Ethical Treatment of Animals) is familiar with our operations and had us, among a few other beauty brands, approved. 1. Vegan brushes are safe, fluffy and friendly on the skin. Nanshy vegan makeup brushes are hypoallergenic. They are friendly on the skin and do not cause irritation regardless of your skin type. Having sensitive skin used to be a problem when applying makeup, but since they were designed to be soft and fluffy, this is not the case anymore. With the brushes, you do not have to worry about allergic reactions including an itchy face, rashes, sneezing sessions, and watery eyes. 2. Vegan brushes are more affordable. Compared to animal brushes, vegan brushes made by Nanshy are affordable aside from being durable. You can bend, flex, and use them multiple times, and instead of needing to purchase replacements after each makeup session, they will still be around. Despite their affordable price, the brushes do not get damaged easily. They will stay in the same condition when you first had them no matter how long you have been using them. Granted you handle them with care, they will last a long time. 3. Vegan brushes are made with the help of the latest technologies. Nanshy’s vegan brushes have finer bristles since the latest technologies helped in manufacturing them. Since skilled professionals made them, users can expect them to be smooth, firm, and less rough on the skin. As a result, you can apply makeup with precision, which can help you enhance your appearance and build your confidence. 4. Vegan makeup brushes are much easier to clean. We, at Nanshy, are aware of the harsh truth that before passing approval, cosmetic manufacturing organizations all over the world are obligated to do at least fifty experiments (which requires around 12,000 animals). While some treat them with care, others could not care less about their subjects and focus on the primary objective. During testing, it was found that over 100 million animals were killed. Either that or they were left permanently blind, crippled, or poisoned. Their unfortunate fates were due to a variety of allergic reactions. Even though achieving results would not have been possible were it not for them, it is no secret to us that guinea pigs, hamsters, rabbits, and mice suffered. Some cosmetic manufacturing organizations who conducted animal testing were hardly mindful of the brutal procedures. To call out for the proper treatment of animals, many animal rights activists worldwide have relayed complaints. In addition, due to their insistence, operations were banned in certain countries including India, Israel, and Norway. Sadly, however, in China, among other places where the cosmetic business is a billion-dollar industry, the excruciating tests on animals are ongoing. Animals are still being subjected to the application of toxic chemicals on their skin and force-feeding of lethal doses of chemicals. Not only do we fight for the proper treatment of animals when having our business, we, at Nanshy ensure that the vegan makeup brushes we provide are not harmful to you, too. Apart from the fact that we have PETA’s seal of approval, we are known as a trusted cruelty-free cosmetic manufacturing organization. With us, you can be confident that you will be using safe products and accessories. You may think that we, at Nanshy Makeup Accessories went wrong in using synthetic nylon bristles, instead of natural bristles, for our brushes. Well, you are mistaken. The thing about natural bristles is they were made of animal hair. Before putting them into brushes, they were part of an animal – a living animal probably harmed during the process. Other than that, they are often abrasive, which could irritate sensitive skin. Synthetic nylon bristles, on the other hand, were made without animal fur and are suitable for sensitive skin. With their softness, they were meant to be more comfortable for you. In other words, they were made to remind you that applying makeup should not be a bad experience. Rather, it should be a treat – for you and for your skin. 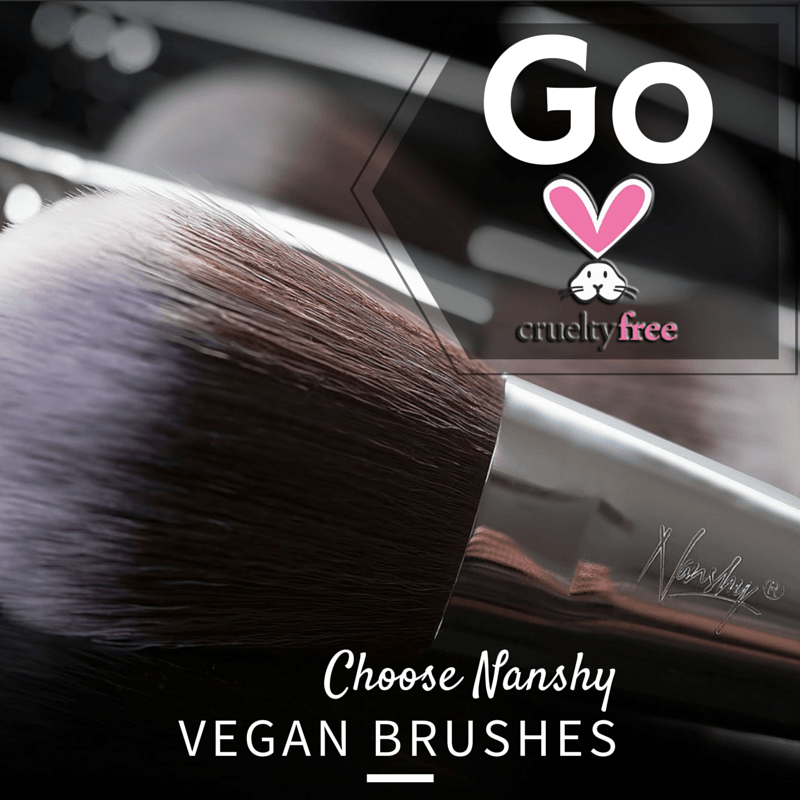 Why Choose Nanshy Vegan Makeup Brushes? Contrary to the false assumption that the quality of synthetic nylon brushes could not compare to that of natural animal brushes’, vegan brushes made by Nanshy are much better and are on top of the game. They are soft, firm, and long lasting – just what you need and want your brushes to be. In fact, many of our customers have testified how pleased they are with synthetic brushes. To get started using Nanshy vegan brushes, head over to our online shop to view the collecion and real customer reviews – Shop Nanshy Brushes Now.